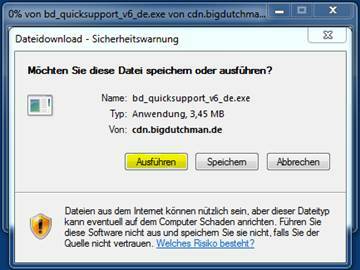 Are you a Big Dutchman employee and have a problem with your Big Dutchman computer system? Let us help you. Please contact the Big Dutchman helpdesk at the numbers listed below and start the Quicksupport program in your language (English will be offered should the program not be available in your language) to allow us remote access to your computer. Please inform the hotline colleague which ID and password you are shown to enable him/her to connect to your desktop remotely. You could be confronted with the following information when you start the program. Please click on "Install" in each case. We will then be able to access your computer remotely.